Walking the halls of Reagan National Airport, you can almost hear the American anthem ringing in your ears, as your right hand nearly imperceptibly hovers toward your left shoulder. Why the sudden swell of patriotism? Simple. You’re in Washington, DC. 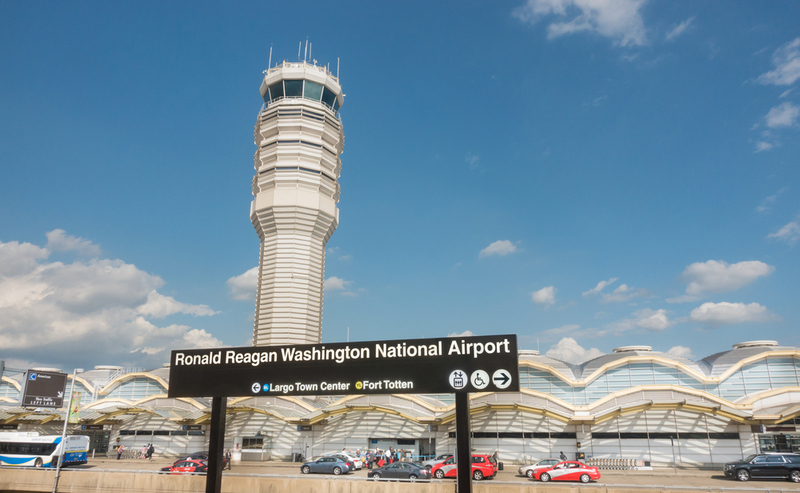 Located just south of the city centre, DCA serves over 20 million passengers in a given year, with nearly 50% of its air traffic being shuttled in and out by American Airlines. Visitors sojourning in the nation’s capital are guaranteed to be up to their eyeballs in sightseeing destinations: history buffs can enjoy the Lincoln Memorial and the Washington monument, making pitstops at the White House and Capitol Hill – not to mention the city’s many iconic museums, including the famed Smithsonian and the National Museum of Natural History. Each terminal at DCA is served by its own parking area. The Terminal A Garage is connected to the airport by an underground walkway, serving Air Canada, Frontier, Southwest, and Sun Country. It will run you $6 per hour and $25 per day, and can be accessed by the West Entrance – the East Entrance is permanently closed, so make sure to read the signs! This garage also offers shuttle service to the other terminals. Terminal garages B and C serve American, Alaska, Delta, JetBlue, Virgin America, and United. They both adhere to the same fee structure as Garage A. They are also connected to their respective terminals by covered walkways, with shuttle service to the other two terminals. Garage B features electric vehicle charging stations, making it the best option for enviro-friendly motorists! Economy parking is ideal for longer stays, at just $17 a day (no hourly rate is available for this lot). It serves every airline that passes through DCA, and provides a shuttle to every terminal. If someone is coming to scoop you up from the airport, the Cell Phone Lot provides free parking for up to one hour as long as the driver stays with their vehicle – the perfect antidote to garages with an hourly fee. Just a few minutes West of Reagan National, Jefferson Davis Highway is dotted with airport hotels that are ripe for the picking. The Hilton Crystal City, Hyatt Regency Crystal City, Courtyard by Marriott, and Embassy Suites can all hook you up with a free airport shuttle. Rooms at the Residence Inn by Marriott (Pentagon City) have a full kitchen, whereas the Sheraton Pentagon boasts a rooftop pool. Budget buyers may be interested in the Hampton Inn, which includes free breakfast and free wifi. The Crowne Plaza is also a free wifi zone. The airport is served by DC’s Metrorail system via terminals B and C. SmarTrip cards are available for purchase at the subway station, and will serve as your reloadable bus pass for the entirety of your stay. For $10, your card comes pre-loaded with $8 worth of fare. Day passes that grant you unlimited use of Metrorail and Metrobus travel are also available for $14.75 – after that, they can be recharged just like any other fare card. Airport parking doesn’t have to be a hassle. With OneStopParking, you can enjoy access to the cheapest rates available for your stay, as well as the ability to book your spot online!